Írásos, "written" embroidery, a true expression of Kalotaszeg and Transylvanian culture and the pride of its people, adorns textiles for use in the home and for decoration. The first pieces [approximately] date back to the 18th Century. Wall hangings were produced to commemorate ceremonies and as gifts for the church. Girls would sew their dowries, comprised of pillows, sheets, and bedspreads, as well as elaborately decorated dresses that included ribbons and beadwork. 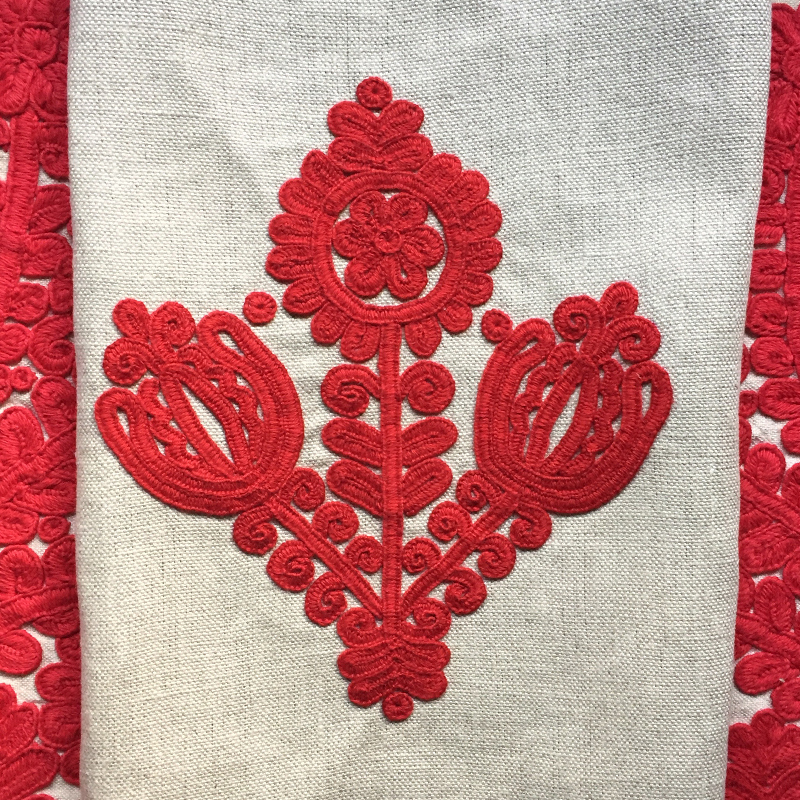 This class will teach the basic stitches of Hungarian Written Embroidery, a folk style that originated in Transylvania, Romania in the late 18th Century. As the basic chaining stitch is learned and mastered, a beautiful pattern will emerge. Students will stitch a traditional heart or tulip design on a piece of linen that can later be sewn into a small bag, pin cushion, or decorative hanging, or added to a quilt or clothing. Students will also take home materials to create more pieces as well as accompanying resources on Hungarian embroidery and patterns. Sarah will share her knowledge of the culture and history of Transylvanian textiles and her extensive travel experiences in Hungary and Romania. 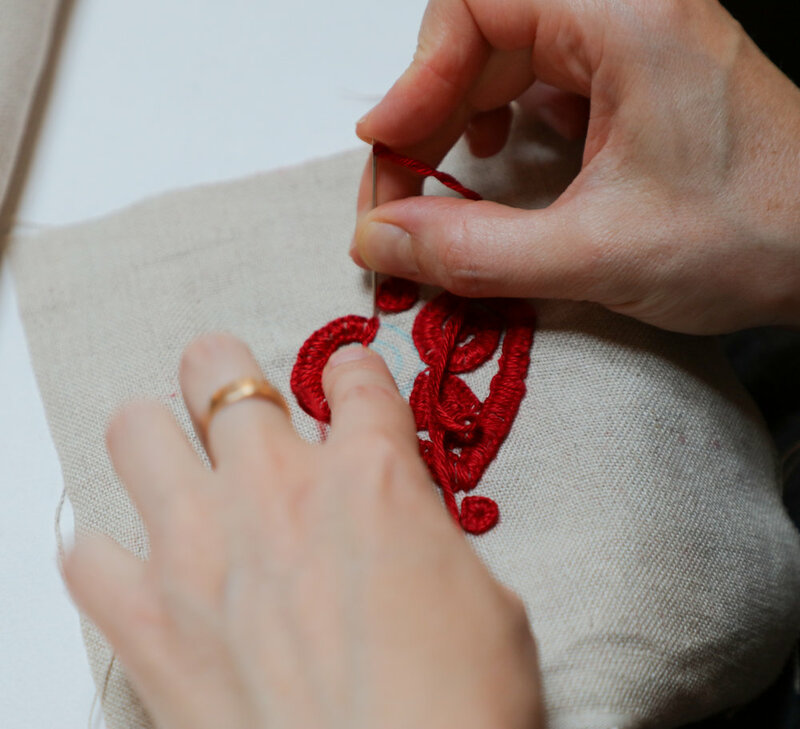 Sarah Pedlow is interested in traditional embroidery, cultural preservation, and creating a global community of makers connected via cultural heritage skills. From 2012 - 2015 she researched Hungarian Kalotaszeg written embroidery in Transylvania, Romania and made products with women artisans. Through many trips to Hungary and Romania her love of embroidery grew, prompting travel for artist residencies in Iceland, Mexico, and this summer, The Netherlands and Ukraine. Sarah teaches workshops and lectures in the San Francisco Bay Area and across the country. She holds a BA in Studio Art and French Studies from Scripps College, Claremont, CA and an MFA in Visual Arts from Rutgers University.